H.M.S. Pinafore; or, The Lass That Loved a Sailor, is a comic opera in two acts, with music by Arthur Sullivan and a libretto by W. S. Gilbert. It opened in London, England, on 25 May 1878 and ran for 571 performances, which was the second-longest run of any musical theatre piece up to that time. H.M.S. Pinafore was Gilbert and Sullivan's fourth operatic collaboration and their first international sensation. This is not that opera. 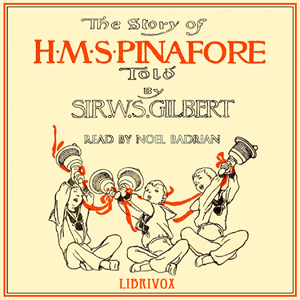 It was adapted as a children's book by W. S. Gilbert entitled The Story of HMS Pinafore, or The Pinafore Picture Book, and includes some lovely illustrations by Alice B. Woodward that can be seen by following the archive.org link to the actual scanned book if you wish. No singing or any of Sullivan's music, just Gilbert's witty words laid out - by him - in prose and poetry with amusing asides.